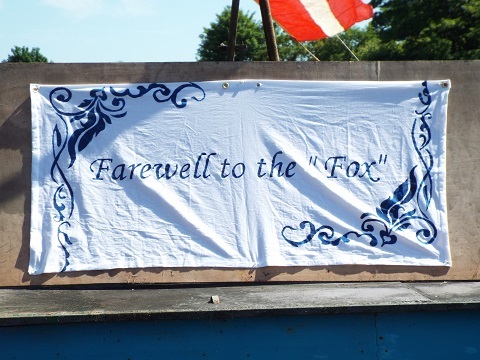 The Fox belonged to the late Syd Shine, musician, band-leader, sailor, bargeman and IWAI founder. The story of how he came to buy the boat has been told and re-told many times in Irish inland waterways circles. Syd died a couple of years ago and the boat was put on the market a while back. 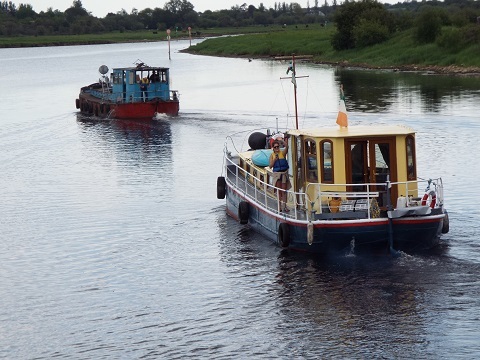 It was sold recently and the photos and videos are of the departure from her berth of 40 years at the Watergate in Athlone for delivery to her new owners. The first leg is to the dry-dock in Shannon Harbour and after a bit of TLC and survey work, she will continue on to her new home on Lough Derg. At mid-day Thursday 2nd June a small group of people, gathered at the Watergate to bid farewell. Syd’s old band, “The Saints” reformed for the occasion and tunes were played and ditties were sung. 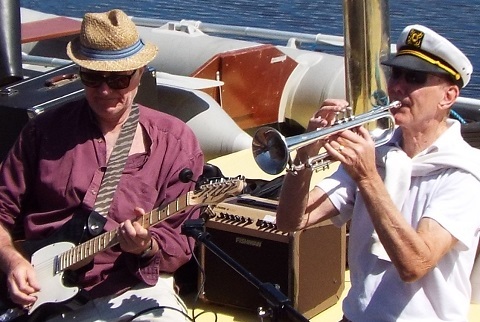 Teddy Knight made a very short and somewhat emotional speech about Syd, the boat and the band and then about 12:30 the old R6 engine was coaxed into life, (actually that’s poetic licence, it started on the button but there were a few snags with leaky water hoses!) the mooring lines were cast off and Fox began her delivery trip escorted by MV Miranda (with the band still playing! ), MV Geretta and DB Ebenhaezer. The WI launch Inisfree was also in attendance for a time. The small fleet rested in the lock over lunchtime and then at 14:00 the lock was emptied, the gates opened and Fox with Teddy Knight at the wheel and Colman Byrne as deck-hand began her trip to Shannon Harbour to begin her new life, leaving behind the berth she had occupied in Athlone for 40 years and drawing to a close another chapter in Irish waterways history.